This is a very difficult subject however we feel that it is extremely important to be open and clear about what can expect from us at a very difficult time As important to residents as the quality of their lives while they are living in the home, will be the way in which they are cared for during the process of dying. This means that their physical and emotional needs are met, their comfort and well-being attended to and their wishes respected. Pain and distress is controlled and the privacy and dignity of a resident who is dying is at all times be maintained. The fact that most residents die in the homes they are living in rather than returning to their own homes or being moved into hospital does not mean that dying and death is routine and commonplace. The impact of death on the community of residents is significant and continuing and we ensure that opportunities are available for them to come to terms with issues of life and death in the way that each individual finds best. This is done by ensuring that opportunities are provided for meditation and reflection, for contact with local religious and spiritual leaders and that there is an openness and willingness on the part of staff and others involved at Mellor Nook to talk about dying and death, and about those who have recently died. The issues around dying and death are very sensitive. Mellor Nook's operational policies which deal with quality of life before death, planning in anticipation of death and the practical and legal requirements following the death of a resident. Policies are clearly expressed and information made available to residents and their families and friends when they first come into the home. Some people will be clear about their preferences with regard to care when they are dying and the formalities to be observed after their death. They may be very ready to discuss it with those closest to them and with staff. In other cases, people may be more reluctant to broach the subject, or have it broached with them. Staff are alert to occasions when individuals may reveal their thoughts and preferences unexpectedly so that they can make use of this when the time arises. However it is done, the process of talking to residents about their death is a delicate one which is done sensitively and with compassion. It may be very time-consuming. · any other personal request. Information of this sort, once gathered, is confirmed periodically and always observed at the appropriate time. These matters are handled by relatives, a solicitor, an appointee, an attorney or the Court of Protection, Court of Session or the High Court. The resident may have completed a next of kin instruction form or left other written instructions. Wherever possible, the resident's wishes are to be respected and carried out. Mellor Nook is never involved in any financial arrangements. Some people may express thoughts about dying, in particular their hope for a peaceful, pain-free death or their fear of death and their concerns for those left behind. Those who are in the position of providing care and support do everything they can to calm these fears and attend to these concerns. Staff adopt an approach which is honest and open about the facts of illness and death, should the individual ask them. At Mellor Nook there are particular members of staff with experience and training in looking after people who are dying and can advise other members of staff. All care staff receive some training through NVQ in looking after people who are dying and are aware of their physical and emotional needs. They only act within their competence and know when to call upon others. 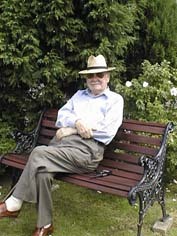 A dying person receives all the care and comfort that is required. Particular attention is paid to keeping the person comfortable and responding to any requests. This may involve moving the person's position regularly (sitting up or lying down), keeping the person clean and cool, paying special attention to the person's mouth and giving regular drinks, and helping him or her to use the toilet. Additional staff are brought in if required and night staff are fully involved to make sure that care is given constantly throughout the night. A ripple mattress may be helpful,. Expert advice on pain control and management is sought for all residents who need it. Medical practitioners, community nurses or specialist nurses such as Macmillan or Marie Curie nurses can provide advice and assistance. Any painkilling or respiratory drugs are given only under the supervision of a doctor. At Mellor Nook a person close to death is not to be left alone, although any wish to be alone is be respected. Relatives and friends may wish to be involved, but if there are none, staff have a special role to play. Above all, at all times, the privacy and dignity of the dying person is preserved. Attending to the physical needs of the person washing, bodily functions, feeding is done in private. Staff do not assume that the person cannot hear what is being said so they never talk about the individual when they are in his or her presence. Residents are able to die in their own beds in their own rooms, surrounded by familiar people and possessions. Wherever possible, residents do not have to move away from the home to die (unless it is essential for them to go into hospital). Following death, the person's body isn't moved from his or her own room to another part of the home before being taken away by the undertaker. 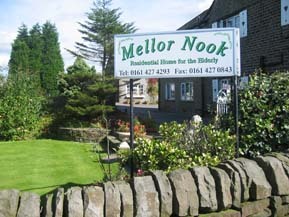 Mellor Nook is aware of the care and services which local hospices have to offer. Many have outreach services and are able to offer help in the home without the resident having to be admitted to the hospice. Where the person is in extreme pain or has other complications, it may be better for him or her to be looked after in a hospice or a hospital. Such decisions are only made after consultation with the person, any relatives and on medical advice. Any wishes of the resident, are respected if possible. The resident should also be able to return to his or her own home if possible and if he or she so wishes. Relatives may wish to be with their dying relative and every encouragement and opportunity is made for them to do so if this is known to be in accordance with the dying person's wishes. Space and a quiet room is available for relatives to sit, collect their thoughts and grieve. Meals, refreshments and other facilities are made available. This hospitality is extended to relatives whether they have been regular visitors or not. Some relatives may wish to be fully involved in the care of their resident while others may just wish to be close by. Staff ask about relatives' wishes and facilitate them. The size and nature of Mellor Nook to a certain extent dictates how the other residents are involved. In general they are kept informed of someone's impending death and are encouraged to visit him or her if they so wish. Cultural or religious practices may be appropriate such as prayers, vigils, playing favorite music or welcoming relatives. All staff who have had any involvement with the dying resident and this includes managerial as much as it does care staff are kept informed when someone is dying. Those who wish are given time to spend with the dying resident. This is one way we ensure that there is always someone present. Support is given to staff who have been closely involved with the resident and their emotional needs are recognised and catered for, particularly in the case of staff who are witnessing death for the first time. All the necessary procedures in terms of washing, dressing and laying out the body is undertaken sensitively and with dignity by the Undertakers. If the next of kin or those most closely involved were not present at the time of death, then the manager or deputy will inform them as soon as possible that their relative has died. Depending on who is responsible for making the arrangements, the manager or deputy dose what is necessary or give whatever help is required to support the relatives. Whatever the position Mellor Nook is likely to have a central role. The manager will also inform the registration authority and follow any other agreed organisational procedures Re: Regulation 37. · a plant, picture or piece of furniture in memory of the person. Residents and staff are able to attend the funeral or other ceremony if they wish. Transport can be arranged and staff rotas when possible will be adjusted either to provide escorts for residents or so that staff can attend in their own right. Mellor Nook always tries to represent the home at funerals. Staff are alert to the impact the death of individual residents may have on those remaining in the home. They are trained to recognise symptoms of grieving and learn how to respond. Formal bereavement counseling or contact with a specialist organisation may be appropriate. In the case of people with memory loss, changes in their behaviour may indicate the impact the death of a fellow resident has had on them and staff will be ready to offer comfort and support. Within Mellor Nook, the loss of one of a couple, or of a close friendship needs special and sympathetic support. Particular sensitivity will be needed in some practical matters such as any change of accommodation or disposal or handing over to relatives of clothes and other belongings. These are never rushed. Many people come into a home after their partner has died. Staff recognise that new residents may be going through a grieving process and they therefore are sensitive to their sense of loss and offer support. The quality of support is enhanced by specific training. The agreement of residence outlines the fees payable in the case of the death of a resident. The former resident's accommodation will be available to his or her family for a reasonable period of time in order for personal possessions to be removed and affairs completed. A balance should be struck between this need and the time necessary to prepare the room for a new resident. A final account will be rendered in accordance with the terms and conditions agreed at the outset and any valuables and property held for safekeeping will be returned to the executor.